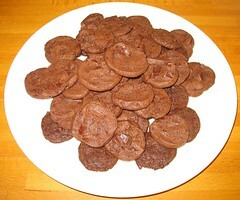 These were the World Peace Cookies from Dorie Greenspan’s book. 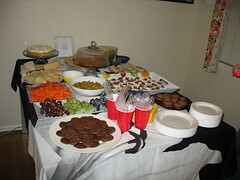 I was utterly charmed by her little sidebar story about being served these at a party where she was the guest of honor. I really liked these cookies and the sweet/salty balance they had. I was a little concerned because the dough, when shaped into logs, looks, quite, well, icky. I persevered and the resulting cookies were well worth the effort. I used Scharffen Berger cocoa powder and bittersweet chocolate. I baked these exactly 12 minutes and they were perfectly done. These were easy and I would certainly make this again. Excerpted from Baking: From My House to Yours by Dorie Greenspan (Houghton Mifflin, 2006). Copyright 2006 by Dorie Greenspan. 3. Turn off the mixer. Pour in the dry ingredients, drape a kitchen towel over the stand mixer to protect yourself and your kitchen from flying flour and pulse the mixer at low speed about 5 times, a second or two each time. Take a peek — if there is still a lot of flour on the surface of the dough, pulse a couple of times more; if not, remove the towel. Continuing at low speed, mix for about 30 seconds more, just until the flour disappears into the dough — for the best texture, work the dough as little as possible once the flour is added, and don’t be concerned if the dough looks a little crumbly. Toss in the chocolate pieces and mix only to incorporate. 6. Using a sharp thin knife, slice the logs into rounds that are 1/2 inch thick. (The rounds are likely to crack as you’re cutting them — don’t be concerned, just squeeze the bits back onto each cookie.) Arrange the rounds on the baking sheets, leaving about 1 inch between them. 7. Bake the cookies one sheet at a time for 12 minutes — they won’t look done, nor will they be firm, but that’s just the way they should be. Transfer the baking sheet to a cooling rack and let the cookies rest until they are only just warm, at which point you can serve them or let them reach room temperature. 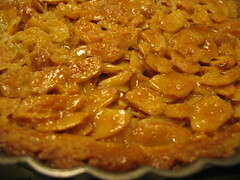 The almond tart recipe is from the blog of David Lebovitz. 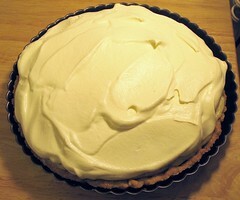 This came together very easily and the only tricky part was removing the sticky bottom of the tart pan. The detailed instructions listed lining the bottom rack in the oven with foil and this was an absolutely crucial step and definitely saved me a clean-up hassle. This was tasty and I highly enjoyed it. I would definitely make it again. This is from the Alice Waters book, The Art of Simple Food. I used a mixture of pecans and walnuts (about 50% each). These cooked up very easily. They weren’t as “candied” as I expected and the spice added a nice touch. They were hard to photograph and they are a bit “ugly”. They don’t have that hard candy coating, but instead a lumpy brown sugar coating. 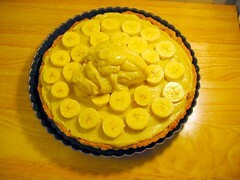 I would make this again, but only for a casual party or when I wasn’t as concerned about presentation. This was the only dessert from the party to make it to work and it received many compliments, so perhaps it is only my perception that they aren’t “pretty”. 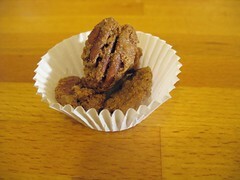 Serve these nuts as candy, use them to garnish a cake, or fold into homemade ice cream. Mix together until all the nuts are coated. Pour onto a lightly oiled baking sheet. Bake for 30 minutes. Turn the nuts from time to time with a large offset spatula until all the nuts are coated and dry. Let cool before serving. Store in an airtight container. This recipe is from David Lebovitz. They were much easier to make than I was expecting. I used the chocolate filling and clearly did not overfill them since I had some leftover to eat when I was done (which was delicious) I made these a little larger than suggested and it only made 10 cookies. I would absolutely make this recipe again. This is from Baking: From My Home to Yours by Dorie Greenspan. I became acquainted with this recipe while following the group, Tuesdays with Dorie, it was the group recipe on February 12, 2008. If I get my act together, I may even join the group, but making a recipe a week is ambitious. 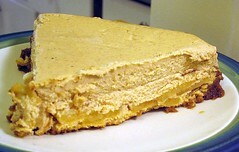 There are several online descriptions of the recipe, including here, here, here, and here. I sliced my apples (instead of cutting them in 8ths) using my all in one peeler/corer/slicer. I love that device, it makes using apples so much easier. This was a hit at the party and several people picked it as their favorite dessert. It was tasty with a nice flavor profile (cinnamon and brown sugar) and the cheesecake layer was very smooth and just what I expect from cheesecake. I had a little issue with the contrast in texture between the cheesecake and the apples, it was just slightly difficult to slice all the way through in a smooth motion. I placed the apples on the very bottom and I might consider placing them in the middle instead. Overall, I liked this recipe and would make it again.